That day I got quite lucky. I was offered a Fresh Mango Frappé from Le Méridien. It’s pretty nice, just a wee bit too sweet for me. Easily made with mago purée, mango juice, mago syrup, ice, fresh mango and a hint of mint for the freshness. Actually i think the mint makes it good and increase the flavors. A bar-restaurant providing latino/jazz live concerts and a danse floor, that makes it a must see. You can choose between 2 sets with appetizer, soup, main dish and dessert, or “à la carte”. We picked the first set. Hum, the ‘salad’ had nothing to do with a salad actually: it was salami with melting cheese. This was nice. I didn’t want any soup, so i’ll skip this part. The main dish was a risotto with roasted chicken. The chicken was ok, but unfortunately, it wasn’t the case for the risotto: too much pepper, too much cheese, and the sauce was really too strong. The rice was overly cook for me (but it depends how you like it). The crème brulée with berries was nice, even though it lacked berries (4 berries in a crème brulée, that’s a little light). As for the cocktail, i chose the “Paris Runaway”, which was too sweet and chemical (the strawberry sirop). However my friend’s cosmo was ok, so i guess it depends which cocktail you pick. The live concert was really nice. We had a latin girl singing, and Taiwanese dancing quite well! Looking at them, they all had salsa class before. The atmosphere is really nice and the place also trendy with nice lights. I suggest you to arrive before the concert otherwise all the seat will be full. Count at least 560NTD for the dinner and around 350NTD for a drink. 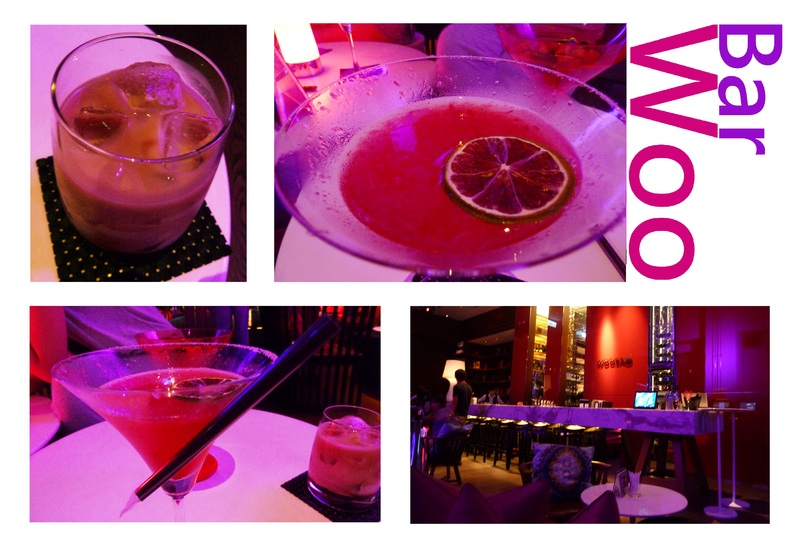 On top of the W hotel, you can find the Yen bar, with a nice view over Xinyi area. The bar is really small, so you better come early. The place is fancy and trendy, and the cocktails quite good. I tried the Ms W with truffle infused vodka, rose, vanilla and champagne (if i remember well). Quite pricy (it starts around 600NTD), but the bar is nice and you have free refill of sweet potato chips. It’s a good option if you want to go to clubs after. Then we went to a nice bar that a friend told us about. You can see her blog here. She takes amazing pictures so if you want some to see the real thing about Taiwan, go and see her. Anyway, i took one of her pictures because my camera didn’t work since it was too dark. 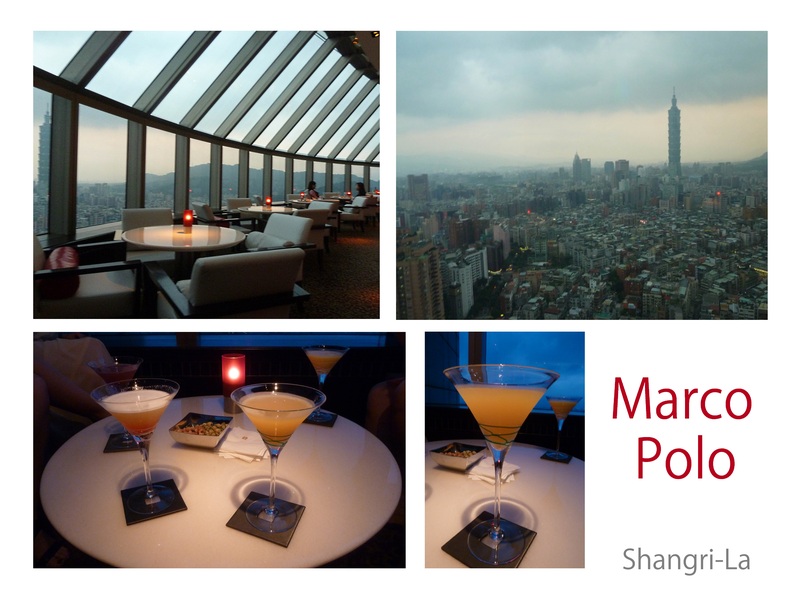 The bar was at the 38th floor of the Shangri La hotel, and have an amazing view on the city and Taipei 101. The cocktail were not that good for some of my friends (mojitos and long island ice tea, which i thought was nice because it wasn’t too sweet and a little bit sour, but maybe that’s because i really don’t know anything at cocktails.). But the one we took with another friend was awesome: Bird of Paradise: Baileys, banana cream, Tia Maria, milk, cinammon, and maybe grenadine, i can’t remember. Delicious but too small! The view is worth coming, and the environment is nice and cosy. Count around 450 TWD for a cocktail.